March 14, 2018 March 14, 2018 Newsdesk 0 Comments Arunachal, Pare HEP . The CCA clearance for Pare HEP was accorded on 4th December, 2008, Papum pare district of Arunachal Pradesh . The execution work of the project started from Sept, 2009. The targeted schedule for commissioning of the project is 31.03.2018. The project will generate 110 MW power, out of which 12% free power will be given to the state Government of Arunachal Pradesh and additional 1% cost power will be used for local area development. 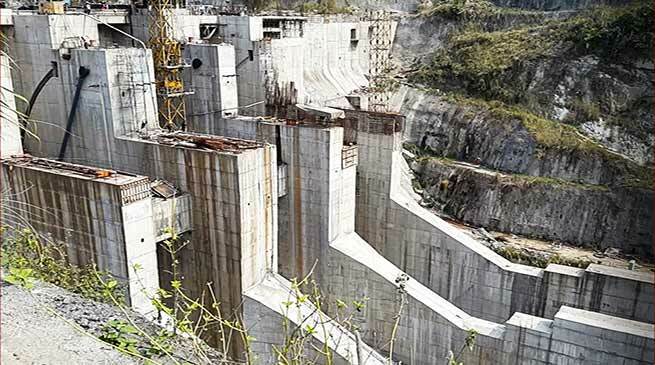 To commission the project by March, 2018 the Diversion Tunnel Gate is lowered on 13.03.2018 at 2 PM successfully for impounding of reservoir. Tai Kaye, Deputy Commissioner Papum Pare along with Head of Project, PHEP and other officials witnessed the lowering of Diversion Tunnel Gate on 13.03.2018. Meanwhile, DC urged upon the upstream and downstream people of pare project to cooperate and take care of themselves so that no untoward incident happen specially at the up stretch reservoir area as water level started submerged and bear with the District Administration till mitigation plan like security fencing and other security arrangements are done up to Jampa and Hara Hapa area. Further, the people of the area in hundreds are enjoying fishing in Pare river which may invite un-necessary problems while fishing in large scale. However, wide publicity is made in this regard in advance.